This porcelain cup standing 2-3/4" high with for a western eye mostly disturbing crackle is almost touching in its ambition to cater to the Chinese feel for antiques and tradition. Something further indicated by the mark "Da Qing Fang Gu" meaning "Great Qing Imitate Relic". 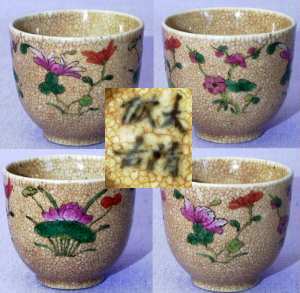 The crackled glaze is directly related to the highly regarded Song dynasty "Ge" glaze. When it came out fresh from the kiln, it looked like crackled pieces of ice just barely held together, as of magic. The staining of tea or scholars ink - maybe after long use - enhanced the effect. Not that any Song scholars would have ever dreamt of disfiguring this famous glaze by fencai enamels. Concerned that the ge glaze would not be enough to make the possibly European customer part with some dearly needed cash coins for this "antiquity", the potter added the Four Flowers of the Seasons. The Lotus, flower of the summer and the seventh month, and the only plant with a place of honor among the eight Buddhist symbols, also an important symbol for purity, truth and fertility. The Chrysanthemum, symbol of the autumn and the ninth month, first mentioned in the Book of Rites written in the Zhou dynasty. A well-known herb used to prolong life and by the Song dynasty Scholar Zhou Dunyi (1017-1073) regarded as the flower of scholarship and loneliness. The Plum blossom, symbol of the winter and the forth month. Actually, the "plum blossom" in Chinese art is not "plum" - it is Prunus mume or "mei" in Chinese, a tree that botanically really are more closely related to the Apricot than the Plum, and so rare in the West that it does not have any Western name I am aware of, which I guess leaves us calling this "Plum" anyway. As the fourth flower, for the spring, I had really expected the Orchid since this is also mentioned in the Book of Rites in the same poem as the chrysanthemum, but instead we are here given the later Peony. A flower which not got its real fame before the Tang Dynasty when it was appreciated by the first female Empress in the history of China - Empress Wu. A symbol for the spring, for female beauty, riches and honor. This all in all quite interesting little bowl probably dates from the latter part of the 19th century or a few decades into the 20th. The translation of the mark, courtesy of Simon Ng, City University of Hong Kong.